When a user leaves your organization or changes positions, you may need to reassign their work orders to another user. The Batch Reassign feature allows you to do this quickly and easily. You can also use the batch reassign feature to batch assign unassigned work orders to specific users. Click on the name of the user you would like to reassign work orders from. Hover over the Shortcuts menu and click Reassign Work. Select the Status(es) of the work orders that you want to reassign. You can select as many statuses as needed. 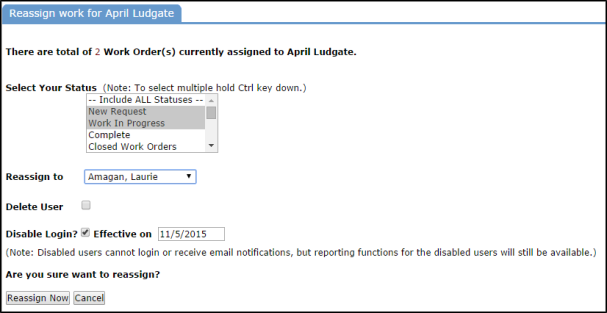 Select the user that you want to assign these work orders to from the Reassign To drop down. You can also delete or disable this user from this screen. We recommend disabling a user account rather than deleting it to preserve the history of the work orders associated with the user account. From your home page, click on Batch Reassign WO under Information Analysis. You can filter what work orders need to be reassigned by entering a Requested Completion Date, Target Start Date, or Target Completion Date. These fields are optional. If you know the WOID, enter it in the text box. If you are entering multiple WOID numbers, use commas to separate them or use a dash if you are batch reassigning a range of work orders. *Note: WOID's entered here will override any of the filters you have selected. Select the Location(s)of the work orders that are being reassigned. If you need to see unassigned work orders across all locations, leave Include ALL Locations selected. In the Assigned To box, click on Unassigned. Select the Statuses of the unassigned work orders. If you need to see unassigned work orders regardless of status, leave Include ALL Statuses selected. Click the Search button to view the list of unassigned work orders. 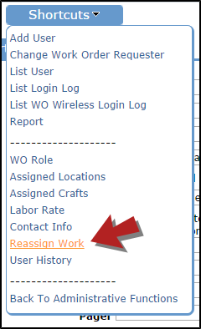 Once you have confirmed that the work orders shown under Work Order Search Results are the ones that need to be reassigned, you can assign them all to one user by selecting their name from the Reassigned All Results to drop down and clicking the Reassign All Work button. A pop up window will appear confirming that you want to reassign the work orders. Click the OK button. If you would like to individually reassign work orders to different users, select their name from the Reassign To drop down next to the corresponding work order in the list and then click Reassign Work at the bottom of the list.